A good way to become informed about the scope of the global refugee crisis is to go to the web sites of those organizations that have devoted years to serving the global displaced population. Chief among these organizations is the United Nations High Commissioner for Refugees (UNHCR). To get an idea of the statistics behind the stories, you can access the UNHCR Facts and Figures page. 14.4 million under the mandate of UNHCR, around 2.9 million more than in 2013. The other 5.1 million Palestinian refugees are registered with the United Nations Relief and Works Agency (UNRWA). During the year, conflict and persecution forced an average of 42,500 persons per day to leave their homes and seek protection elsewhere, either within the borders of their countries or in other countries. By the end of 2014, Syria had become the world’s top source country of refugees, overtaking Afghanistan, which had held this position for more than three decades. Today, on average, almost one out of every four refugees is Syrian, with 95 per cent located in surrounding countries. An estimated 13.9 million people were newly displaced due to conflict or persecution, including 2.9 million new refugees. By the end of 2014 the number of people assisted or protected by UNHCR had reached a record high of 46.7 million people. 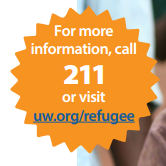 For more information about refugees in Utah, call 211.